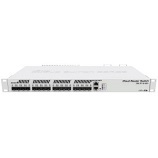 The new Cloud Router Switch 317-1G-16S+RM is a rack-mountable manageable switch with Layer3 features, it has 16 SFP+ ports for high performance 10GbE connectivity and a 1GbE copper port for management. CRS317-1G-16S+RM is powered by a next generation switching chip, giving you wire speed performance for all sixteen 10GbE ports with any Ethernet frame size. New features such as hardware-based Spanning Tree Protocol and Link Aggregation (LACP) provide enhanced protection and true professional performance for your demanding network. The unit has dual redundant power supplies and passive cooling case, so it’s completely silent - for hot environments two redundant fans will automatically keep the system cool if needed.